The cast and crew of The Hunger Games visited Hall H at Comic-Con for the final time Thursday afternoon to promote the final film in the franchise, Mockingjay Part 2. It was highlighted by a brand new trailer whose action was simply beyond epic. The panel began with four people in white outfits coming onto the stage. They unveiled some drums and started banging them, and then a drumline entered in from the back. The dramatic drumming continued and got louder, louder, building the tension until then the video screen turned on: A Message from District 13. The people in the video were dressed in the same white outfits, all acting in unison. Just then, a person begins walking in from the back. It’s Katniss in a full, red outfit that looks like armor. “Freedom is worth fighting for. Stand With Us” the video said. Moderator Conan O’Brien next hit the stage: “I am not in the Hunger Games films, I know you are disappointed.” But Willow Shields, Liam Hemsworth, Josh Hutcherson and Jennifer Lawrence are in the movie and took the stage; they were joined by director Francis Lawrence and producer Nina Jacobson. The trailer basically just sells a huge, huge action movie—which the director reiterated is exactly what he wanted. He called it a “real battle” movie and to shoot it, filming moved from Atlanta to Europe. From there, the panel turned to Twitter questions, most of which were kind of goofy. Liam Hemsworth called Peeta “Peter,” Jennifer Lawrence used the tablecloth to wipe her nose, and Hemsworth and Hutcherson joked they have a kiss in the movie. Talk turned to the final day of principal photography, and a scene between Lawrence and Woody Harrelson. Hutcherson and Hemsworth had already wrapped, but they came back to see it filmed, and of course things got emotional. “That night we held each other and slept like puppies,” Jennifer Lawrence joked. Speaking of spoilers, seemingly all the audience questions were about an epilogue shot a few months after the shoot officially ended, as well as material the film may have added to bridge between the time between the climax and the aforementioned epilogue. Jennifer Lawrence said they shot the latter in the same field where they shot the first scene, and then the director added, “There will be some differences that we made to the books. 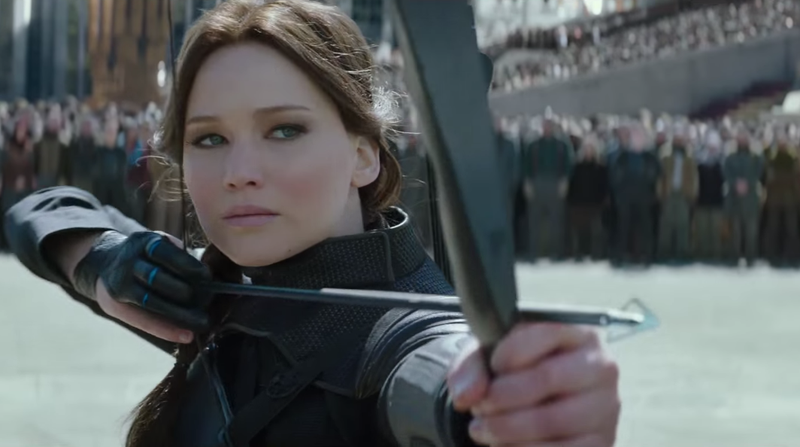 If you love the end of the books, you’ll love the end of the movie.” One of the challenges of it all, according to Jacobson, was to keep Katniss’s character aware of what’s happening in the world. She’s dealing with “the consequences of war and violence,” Francis Lawrence said.